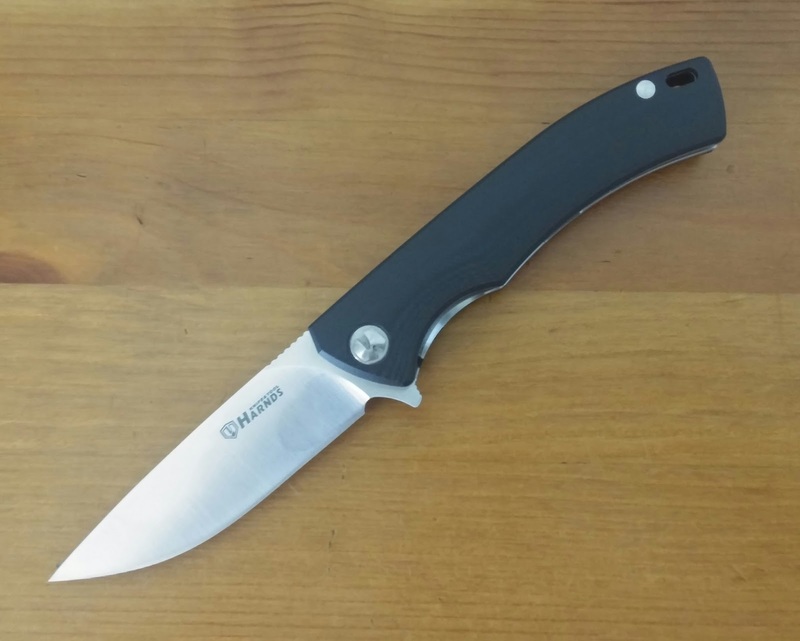 Best Chinese Knives: Harnds Talisman EDC Knife - Rat 1 Alternative? Harnds Talisman EDC Knife - Rat 1 Alternative? I have received this one as well and the review is due. To tell the truth - before ordering this knife I already had a clue about Harnds knives - they always seemed well done, but lacking in the design department and had nothing special in comparison to other budget Chinese brands - Enlan, Sanrenmu, Tekut, etc. When I first saw the Talisman I immediately noticed the difference in price and the looks, which made me want to get this knife and to figure out if it is worth it. Also - I thought to compare it to the newest Ganzo/Firebird models, as I considered them to be the direct competitors of this model. When I unboxed it, took it in the hand and flipped it for the first time - I realized I was off. Harnds weren't competing against Ganzo with this one, they tried to create a direct competition to another great budget knife - the very popular Ontario RAT 1, which is often considered as the best value knife and one of the best knives to get as a first one in the collection. But Harnds went a step further with their intentions and it is clear they didn't want to make just a slightly different version of the RAT 1, they tried to make it different and even improve it. Let's see if they succeeded in this mission. I'll start with the basics, the size and the weight - those are very similar, same blade length, a little shorter handle and overall length on the Talisman (better blade to handle ratio), 5g difference in weight, again in the favor of the Chinese knife. Blade shape is also a reminder - very similar satin finish, also a drop point blade shape, although a slightly different curve. Also - similar blade grind (FFG), blade geometry and blade steel. Locking mechanism is also the same - a liner lock on both (slightly beefier on the Harnds). Centering, blade play - all perfect on both. Lanyard hole - present on both at about the same location. Ergonomics - somewhat similar, both fill the hand well. Both have gimping, steep on the RAT, flat on the Harnds. Blade deployment method - thumb studs vs flipper. Can't really say one is better than the other, just different tastes. Handle material - Clear advantage to the 3D contoured G10 on the Harnds vs the plastic flat ones on the Ontario made knife. Also - standoffs on the RAT vs the ribbed G10 backspacer on the Tali. Liners - one of the biggest drawbacks of the RAT are the non-skeletonized liners, like they are on the Talisman. Pivot mechanism - nylon and bronze washers on the RAT, ceramic (!) bearings on the Talisman. Although the RAT has very smooth action for a washer knife, can't beat ceramic bearings in that area. Pocket clip - Despite the 4 positionable one on the RAT, it is another clear win for the Harnds IMO that has an awesome flexible deep tip down carry one. The overall looks - the RAT looks like a worker/forrest blade. The Talisman is much dressier with the sleek looking G10 handle, that looks much clearer (a lot less holes and screws visible), the better looking pivot screw (proprietary on one side, torx on the other) and can be passed as a gentleman's EDC knife. You must ask by now - with so many differences - how are they similar? This is my answer - although Harnds didn't copy any of the features of the RAT, they managed to "copy" the budget, great value, simple, no nonsense concept of the RAT 1 with this one. The fact that they improved the design by going at the Ontario knife's drawbacks, makes it a great contender for the best knife to get as a first one in the collection or as an addition to the RAT to complete each other. Anyway, I'm in for a small Talisman, even more if they will make it a Kwaiken style blade (for the blade to hide all the way in the handle). By the way, what do you think about the Tekut Zero? Still pretty expensive for a Made in PRC knife with $25 but it's really interesting for a light edc knife. It's interesting alright, but I doubt it is worth the price, especially when the excellent SRM Land 910 (which I will receive soon for a review) is sold for much less. Indeed! My 910+ has the same screws and is ranging at the same level as my Real Steel Griffin, for 1/4th - 1/5th of the price, not to mention US/EU fabrication. So yes, the Tekut is pverpriced, but for $12-$14 I'd maybe give it a try if they come up with a bit more interesting color. Most knives are black and boring, green is meh, maybe a multicolor G10 would be interesting, I'd like to see black/red. Yeah, the only interesting thing about the Zero is the adjustable clip, but it feels a bit gimmicky to me. Agree on the color thing, would love to see that 910 in bright orange or blue G10 versions. Well, the steel 910's are quite interesting, too, they write they come with hollowed handles.